What do you think this Malawian man is doing? I took this photo near Lilongwe, Malawi, yesterday. He is carrying firewood which is twice as much as himself with his rusty bicycle. He is taking wood from Dzalanyama forest reserve where 1 hour away from here by car. More surprisingly, you will see them every 5 or 10 seconds. Imagine how much trees are chopped everyday! So, firewood cooking is not only energy issue, but also deforestation, gender, and health issues. A solder protecting Dzalanyama forest was killed recently.... It is difficult to stop this without an alternative. Clean cooking stoves will be a solution for this complex problem. I am here to help a Kenyan girl to assess the impact of cooking stoves and find its solution. Will see! At Nairobi, a wall paper made a perfect of laugh and smile on my face. Stave, the project leader, removed all posters from the wall of his office, but he still puts up the vulnerability matrix I draw last year. He told me "I learnt so much while we had a training session last year, so I put the matrix there to remind me the memory". The drawing became priceless for me. Please let me know if you are interested in learning this vulnerability assessment method. Change Adaptation project which will be a sister project of the Sulawesi Cacao project. We will not only find the vulnerability of cacao farmers, but also will do trainings and provide financial support. More will be coming! As well as European Commission, these activities in the two cases are funded by Japanese government. 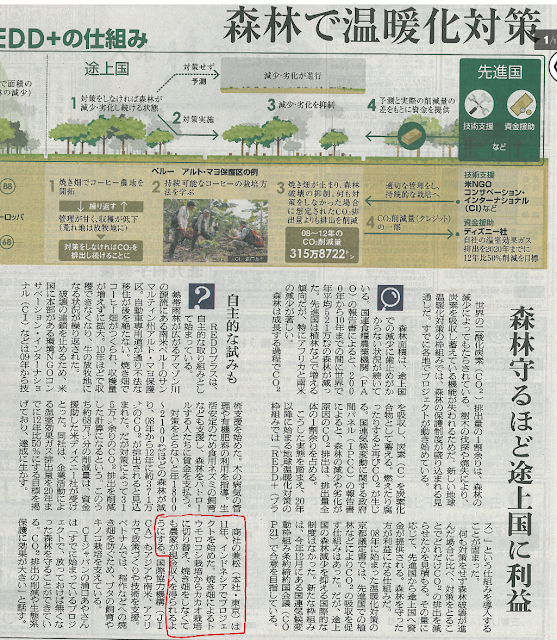 The support from Japanese government was published in two Japanese newspapers. If you are interested, let me know. My two sons (age 5 and 9) asked me "what is your job?" 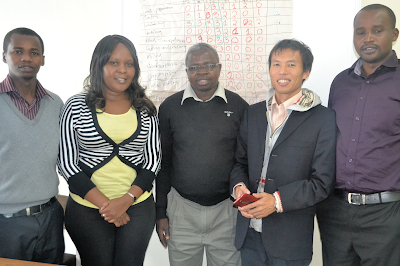 So, I decided to demonstrate one of my favourite job, such as capacity development. Also, I would like to educate climate change to my children as their capacity development. As we live in Bali, Indonesia, I made a drawing activity on "climate change vulnerability in Bali." This was designed for kids, but its concept and approach should work as facilitating a rapid vulnerability assessment for climate change, generally. First, we talked about weather in Bali and I asked my sons what were problems related to weather in Bali. I helped them a bit, but listed "big wind", "rain", "waves", "earthquake", etc. After a bit of discussion, we picked "rain" and "waves". Then, we discussed who and how people are affected by "rain" and "waves." They mentioned "rain gives water to drink", " with rain, plants can grow", "People cannot go fishing when there is big waves", and "surfing!" So, I asked them to draw stories about the rain and waves. The first son (9 year old) son drew rainfall, farmers planting, and people drinking water. Trees are growing high and everyone are happy as they have so much water to drink. But, one person seems unhappy. He can be me as I may also not so happy in the rain. The second son (5 year old) son drew waves, surfers, and fisherman. Sun is shining and there is a huge wave, so surfers are happy even they fall. A huge wave is not a problem for surfers. A fisherman also fell down from the big wave and he is not smiling. This is a problem for the fisherman. With the drawing we could connect the disasters and people affected, so we can see the impacts in the drawings. Also, they know that the same disaster will affect different people differently, e.g. surfer and fisherman. I told them what is the future situation in Bali. This was difficult as little children do not understand probability and uncertainty. I also did not want to be an alarmist to scare them. I have had similar experiences when I worked in rural areas for research and training. Anyway, I told them that Bali was getting fewer rainfall in the last 20 years (Takama, et. al. 2014) and Bali will face the most severe water scarcity in Indonesia (KLH, 2010). Also, I told them that waves can be stronger in the future (shorter wave height, but longer wave period) (Hemer, et. al. 2013). Then, we discussed what they can do about it. As they are small children, their suggestions may not be realistic, but some are quite innovative. For example, they thought if there was no water from rain, people needed to get water from the ocean. Also, they also thought vegetarians would be affected if there is no rain and no plants. So, they thought vegetarians may need to eat some meat. There are practical solutions as well such as "a fisherman needs to find a place waves are small! ".